Condition is New. Monsters Of Rock 1982 Retro look T Shirt. Handmade Condition is New. Taped neck and shouldersPre-shrunk Jersey knitQuarter-turned. 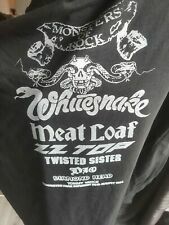 Vintage Monsters of Rock 1986 day festival t shirt. Donnington. Medium but a 1980s medium so easily a small. It's used but overall pretty good condition for its age and the graphic is still vivid for the age. Has been in storage for years. cotton. Front and back graphic. Ozzy Osbourne, Scorpions, motorhead, badnews and warlock. Postage within 3 days of payment due work work. Status Quo Monsters Of Rock 1982 Ticket Stub. This is a used ticket stub for the monsters of Rock concert I went to at Donington park 21st August 1982. The ticket has holes in the corners where I pinned it to my bedroom wall. UK Buyers Only. Monsters of Rock Download Festival Castle Donington Veterans Woven Patch. NEW. Monsters of Rock / Download Festival woven patch. Genuine original design. This design was from the first run of these patches designed for the Monsters of Rock and Download veterans group and there are very few of these about. 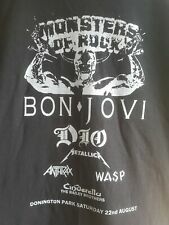 Vintage monsters of rock donnington 1982 t shirt. It's in pretty good condition for its age, graphic is still in good condition. Used but in storage for years. It says large but it's definitely pretty small - appears to be somewhat fitted in shape going inwards on the sides so could be a ladies large? Not sure. Cotton. 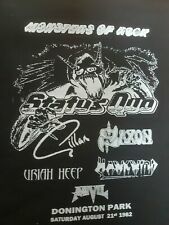 Status Quo, Ian Gillan, Saxon, Hawkwind, Uriah Heep and Anvil. Postage within 3 days due to work. 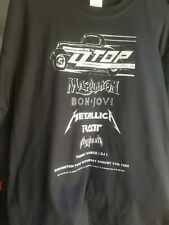 Monsters of Rock Donnington Park 1986 T shirt, authentic. Never been worn in great condition, bought at Donnington. monsters of rock 1990 ticket stub Donington Park WHITESNAKE Genuine. Condition is Good. Dispatched with Royal Mail 2nd Class Large Letter. Monsters Of Rock 83 Tour Programme Whitesnake IN Vg CONDITION Please take a look at the other vinyls we are selling. WE NO LONGER SHIP TO BRAZIL PAYMENT WITHIN 2 DAYS PLEASE. AC/DC 1984. Monsters Of Rock Ticket Stub. Monsters of Rock Festival. Plus Van Halen,Ozzy Osbourne,Gary Moore & Motley Crüe. A fantastic slice of Rock music history. Monsters Of Rock Official Programme 1982 Status Quo Saxondale Anvil. Condition is Very Good.selling many monsters of rock programmes. Title: Monsters of Rock. Title : Monsters of Rock. Format: Box set. Artist : Various. Format : Box set. Release Date : 1994-07-21. Product Category : Music. Condition : Good. Title: Monsters Of Rock. Artist: Alice Cooper. Format: Audio CD. Release Date: 2018-08-03. Condition: New. Donington Park,UK. Fully laminated repro concert ticket from the original on quality 190gsm card. This is a one sided quality repro and is actual size of original ticket. Monsters Of Rock. 18th August 1984. Large concert booklet from the Monster is Loose tour. Bought at the Manchester venue. In near mint condition. Foyer - Braine l'Alleud -Belgium. Concert Ticket - MONSTERS OF HEAVY.